Rocket Matter Knowledge Base Matter StreamWhat is the matter stream? Rocket Matter's Matter Stream is found at the top of your Matter Dashboard. 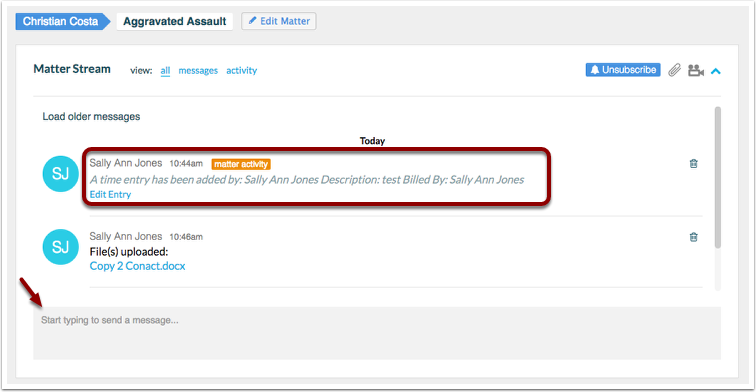 Items that will appear in your matter stream are new tasks, new events & all billable entries. You can even post messages in the matter stream yourself- as a way to communicate with your co-workers and those who are actively working on the matter. By displaying the recent activity in a matter, the matter stream helps you stay in-the-loop! Next: How to 'subscribe' to the Matter Stream.